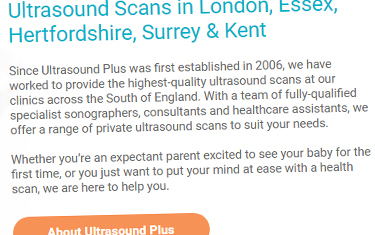 Ultrasound Plus is an ultrasound scan provider with a number of private clinics across South East England. We were asked to develop a new website for Ultrasound Plus – in addition to creating a fresh, professional-looking design, we were tasked with improving search engine optimisation, the aim being to get Ultrasound Plus ranked among the top Google results for a variety of search terms. 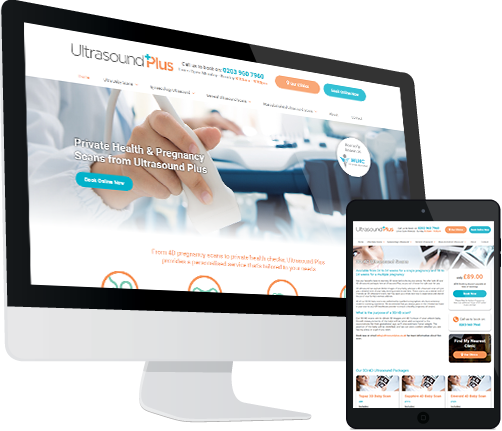 We created www.ultrasoundplus.co.uk, a modern-looking website with a design that speaks to the company’s welcoming brand identity and high level of regulatory compliance. We also provided extensive SEO copywriting services to help maximise the site’s organic search traffic. 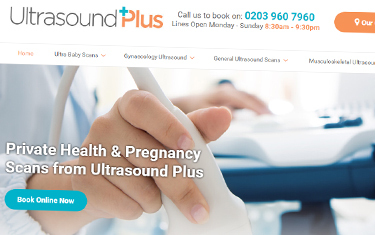 Creating the Ultrasound Plus Website Ultrasound Plus is a well-established provider of pregnancy scans and other ultrasound services in London and the South East. In addition to their popular 3D/4D baby scans – which give expectant mothers a detailed view of their unborn children, plus photos and videos to take home as souvenirs – they also offer a variety of healthcare checks, including gynaecological and abdominal scans. Ultrasound Plus approached us because they were impressed with the work we’d done for First Encounters, another ultrasound provider with clinics in Cardiff and Bristol. 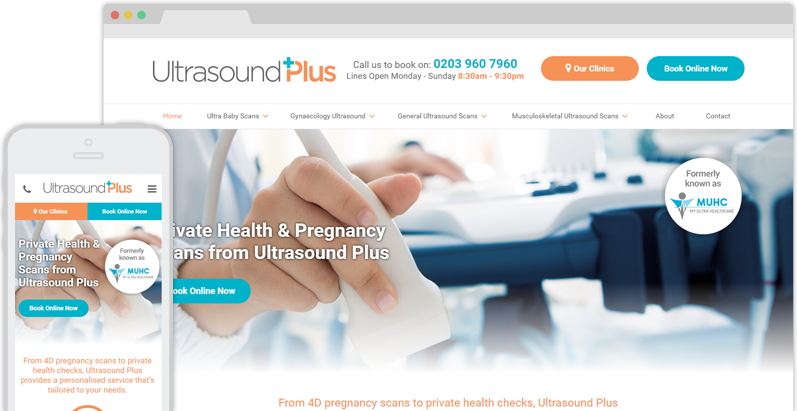 The Ultrasound Plus team wanted to boost site traffic and online enquiries, and so we set about creating a more user-friendly website design and improving their SEO. 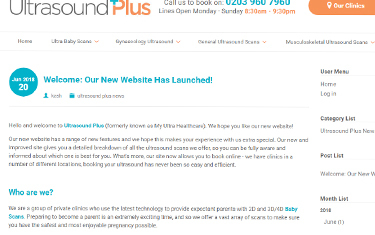 s The new and improved Ultrasound Plus website attracts over a hundred visitors a day. Our design makes it easy to find and book the scan you want, and it looks friendlier and more modern than the design it replaced. New Website DesignThis client’s previous website had a generic Wordpress design that didn’t do a very good job of capturing the company’s personality. We at Designer Websites provided a more colourful, eye-catching design that’s specifically tailored to Ultrasound Plus and their target audience. The new site provides a clear user journey and generally makes the booking process as straightforward as possible. Keyword OptimisationOur SEO experts worked hard to ensure that every page of the new Ultrasound Plus site would have the best possible chance of ranking on the first page of Google results for a relevant search term. The finished website is very well-optimised, and the SEO team collaborated with our designers and developers to ensure that each page satisfies the user’s search intent. Company BlogWe also included a blog engine in the new Ultrasound Plus website, meaning that the company can now share news and insights on their own platform with ease. Blog posts are great for interacting with customers, and they can also be an excellent way to drive additional search traffic – for instance, by writing articles that answer common pregnancy-related questions.